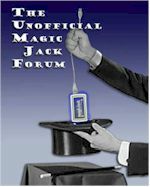 I bought a Magic Jack about a Month ago and the darn thing has worked perfect from the onset. I didn't want to leave my computer on all of the time, But I wanted the phone so I went to eBay and Bought a used HP Thin Client. I never even heard of a Thin Client before but came across them on a google search. It arrived yesterday and was locked out with Admin and User passwords. It also was set up as some kind of Kiosk unit. I was a little upset at first but then went to HP's site and downloaded the Newest XPe Flash file. Put in a 1 gb USB Flash drive in my computer, Double clicked on the .exe and then clicked on Make a Bootable USB image. Set the Thin Client to boot from USB in the bios. Took the USB Flash drive out of my Computer and put it in the TC and Hit the start button. I couldn't believe how easy it was. I just sat back and watched as Windows XPe SP2 was reflashed into the TC. After all was said and done, I hooked up the MJ to the TC and BAM !!! Telephone. I think I called everybody I know to see how it would work and I have to say I'm really happy with it. Don't mind me grammar cuzz it sukks!! I paid $85.00 for the TC on eBay. You can usually find them for under $100.00 there. Does it have a regular Ethernet port or is it coaxial, what speed it the Ethernet? Does it have a USB port? And last but not least would you mind posting a link to the eBay shop you purchased yours from? PS - Obviously it has a USB port or your one of those kind of guy that will stick it any hole he finds. (that's a joke for the sane). Also would you explain this "Put in a 1 gb USB Flash drive in my computer, Double clicked on the .exe and then clicked on Make a Bootable USB image." Double clicked what EXE? Oh ya and a link to the XPe thing you downloaded. I don't mind telling you you have me really excited about this does your look like the picture in the link you posted - As Will would say "I gotten get me one of these"
Sorry you have me so excited about this thing that I am not sure my questions even make sense to me - sorry for the lack of clarity. Baja Broadband, up-1mb dn-10mb, on days with a good tail wind. I'll try to answer your questions the best that I can. The Thin Client has a built in 10/100 ethernet card that uses a standard cat 5 connection. Just type in HP Thin Client in eBay and you'll see a whole bunch of the come up. Atleast that's what I narrowed it down to when I bought mine. Explain >>> I have a 1 Gig USB 2.0 Flash drive that I plugged into one of the USB ports on my computer. The link to the XPe Flash is in the link at the bottom of my original post. Click it then go to the botom to.....How to reinstall or update the operating system. Remember, I never heard of a Thin Client until a few weeks ago and only got mine a few days ago. The thing really does amaze me though. It's about the size of a book. Has no moving parts so there is NO NOISE at all. And I'm answering your post on it. Yes - you have answered everything Thank You! You bought a used one - did it look OK aesthetics are somewhat important to me. It doesn't have to be perfect, but if it is going to sit on my desk... well you get the point. I have never heard of these things either, When you said thin net - I thought that is what they used to call coaxial cable Ethernet, but obviously "what the hell do I know". Aesthetically speaking, Mine looks like it's brand new. Of course you can only see so much on the eBay pictures. These usually sit on a desk somewhere, So how beat up can they be ? The thing that amazes me about these gadgets is I have never heard of them before. I have consider myself a toy freak! These things look like a really great gadget, I hate turning on my machines just to check email or in this case leave a big machine on to service MJ. As far as my legal expertise goes I don't see anything about these gadgets that would offend MJ's TOS either. Oh and you can help me spend my money anytime you come up with something as slick as these things. They have to be one of HP's best kept secrets, or I have been living in a cave. I remember seeing these devices and then POW a ton of bad press. Especially when (at the time) emachinces was selling a complete computer for the same price. There were models before the HP Pentium 3's. There seems to be a little added usability (added hype??) with the idea of using one for a kiosk or for corporations using them to connect to servers. I must have fallen asleep during that portion of the movie because I never heard of them. But like you say for $80 buckaroos they are pretty cool and make for a great MJ computer. I like the size about the size of a cigar box and stone quiet. I think the original purpose was to use them in a Corporate enviroment to link to a Main Server to run specific applications. The way the things are set up, There is virtually no maintenance at all so I don't now why any Techies would complain. But, For whatever reason they are on eBay for $80.00 is fine by me. ALTHOUGH..... I BELIEVE THE REASON WHY THERE ARE SO MANY COMING OUT OF CORP. ENVIRO'S IS BECAUSE ALL OF THE CORP'S ARE CLOSING THEIR US OP'S AND MOVING THEM TO CHINA. I notice that you said you have a T5720. I ordered a 5710, but I wished I had ordered a 5720 for the extra USB ports and it looks like it has much better ventilation. Does yours get hot at all. Looking at the 5710 it doesn't have near the ventilation that yours does. Dam, I am usually not cheap when it comes to buying toys but this time I was. I don't even have it yet and I am already regretting my decision. Also the one I purchased only has 256/256 of memory do you think that will be adequate for MagicJack? Also is it possible for the end user to up the memory like a regular computer? My brother has a T5710 with 256/256 and it works great. It doesn't get hot at all. You won't regret it. If you really want to up the memory.....Flash or Ram ....Later ....you can. He said he may add more in his later if he uses it for more than MJ. Also, He said you can get memory cheap for them. The T5720 that I have has 6 USB port total. 2 in the front that I'll never use..... and 4 in the back. I like the looks of the T5710 better than the T5720 but I wanted a "BUY IT NOW" on eBay at the time and the T5720 was available for a cheap price. I have an old small Compaq iPaq desktop Computer( bigger than a thin client) but was wondering if it is worth using a seperate computer/laptop or thin client to run MJ 24/7 instead of just leaving my main pc on 24/7, I would technically be using more electricity and still sharing my broadband connection,except that my router might be working a bit harder to support another pc on the network(might cause more burps and bleeps)so this is what has kept me from using this method with my MJ.The way electricity rates are going up here in California and everywhere for that matter would it still be a good idea? ps. my computer is on 24/7(p4 3.0ghz HT,2gigs ram and 500w power supply I only rebbot once a week and my wife uses her laptop once in a while. help! I am running out of USB ports!!!!!!! !